REM invites you to cool off at a Picnic in the Pool Party! You can eat in the pool on floating tables or eat at a table on dry ground next to the pool. 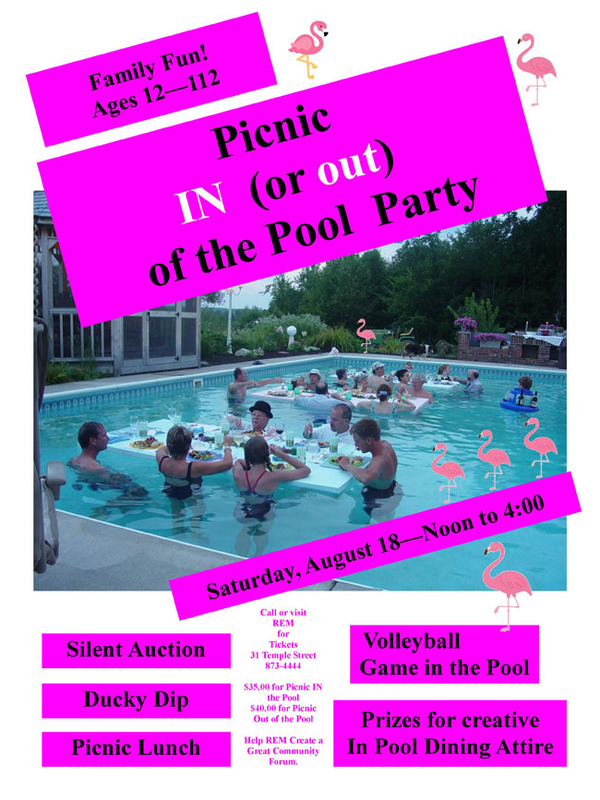 The poolside buffet will include pulled chicken, hot dogs and sausages, baked beans, sweet and savory slaws, a pickle selection, and blueberry desserts...blueberry spice cake, pie, trifle, apple crisp and vanilla ice cream. Beverages will include lemonade, iced tea, beer and wine. Rubber Ducky Dip - rubber ducks will be floated in the pool and people can purchase them for $5.00 each if they retrieve their own or $10.00 each if they ask for someone else to retrieve them. The ducks are numbered and the grand prize will be a week long stay at a cottage on Long Pond in Belgrade Lakes...a gift for the whole family to enjoy. Water Volleyball - it's as much fun watching as it is playing. All afternoon you will be able to bid on items in a silent auction. Don't miss out on this fun afternoon to support REM. Tickets are $35.00 for those who eat in the pool and $40.00 for those seated poolside. For kids ages 12 - 15, tickets are $12.00. Call for tickets (873-4444) or stop by the REM office at 31 Temple Street in downtown Waterville (across from the Lebanese Cuisine restaurant).